To her friends and family in western Pennsylvania, including the Clearfield area, she’s known as Arlene Brown. Her story is as astonishing as her energy; her impact is nothing short of life-changing for so many. 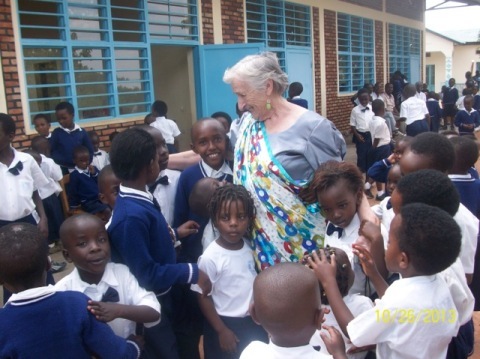 It all began as a mission trip in 1996 that brought Arlene face-to-face with abandonment, abuse and malnourishment suffered by countless children orphaned two years earlier by the genocide in Rwanda. Arlene would return two more times to the African country before the great-grandmother took the dramatic and selfless step of selling her Williamsport home, her car and most of her belongings and moving to a mountainside just outside Rwanda’s capital, Kigali, to care for orphans. What began as the Urukundo (the word for love in Rwanda’s native tongue of Kinyarwanda) Home for 50 children has now grown into a primary school educating more than 800 children whom Arlene and an affiliated non-profit in the United States, Hope Made Real, are helping prepare to be future leaders of Rwanda. Through Arlene – and help from rotary clubs, churches and many individuals throughout Pennsylvania, the United States and the world – the village surrounding Urukundo now has access not only to classrooms, but also to water and school buses, a vocational sewing center, a working farm, a dental office and 88 jobs. “My mission, with the help of innumerable others, is to inspire the next generation of Rwandan leaders by placing these children in family homes where love, care, spiritual discipleship and physical needs are provided until each child is mature enough to live independently,” shares Arlene on the Hope Made Real Web site. Arlene is making a rare visit to the United States over the next couple months. In Pittsburgh, there are two Building Bridges to Rwanda fundraising events planned for the weekend of April 27-28, where people can meet Arlene, hear more about her accomplishments in Rwanda and what more this woman of great compassion has planned in this extraordinary version of retirement. “You can retire from the workforce. Don’t retire from life. You’ve got too much to offer,” she told the Philadelphia Inquirer in a 2015 interview. Both Pittsburgh events will be held at the historic Workmen’s Beneficial Union Building and Spring Hill Brewery, located at 1955 Varley St.
On April 27, from 6 p.m. – 9 p.m., guests will have an opportunity to meet Arlene and two Urukundo graduates, who are now attending college in the United States. On April 28, a brunch and fashion show featuring clothing made at the Urukundo Sewing Center will run from 1 p.m.- 4 p.m. Details can be found at www.BrownPaperTickets.com, by e-mailing hopemaderealpgh@gmail.com, or calling 412-999-1912.